RUYA MAPS’ inaugural project will be an exhibition of work by Venezuelan artist Pepe López (b.1966). The installation is 18 metres in length and is composed of 200 objects wrapped in polyethylene film. Originating from the artist’s family home in Caracas, the objects include a car, a motorcycle, a piano and an urn, as well as books, tools, toys and maps. Their methodical arrangement suggests an imminent move or the need for storage. Examining notions around cocooning and mummifying, the work explores the powerful emotional charge of being uprooted or exiled and references the particular social drift extant in Venezuela, a country that has experienced near consistent political instability since the 1980s. López is particularly preoccupied with the collective memory that can be said to be held by a place and the arrangement of the objects is also intended to suggest a cartography, both physical and narrative, of the collective memories of the citizens of Caracas. 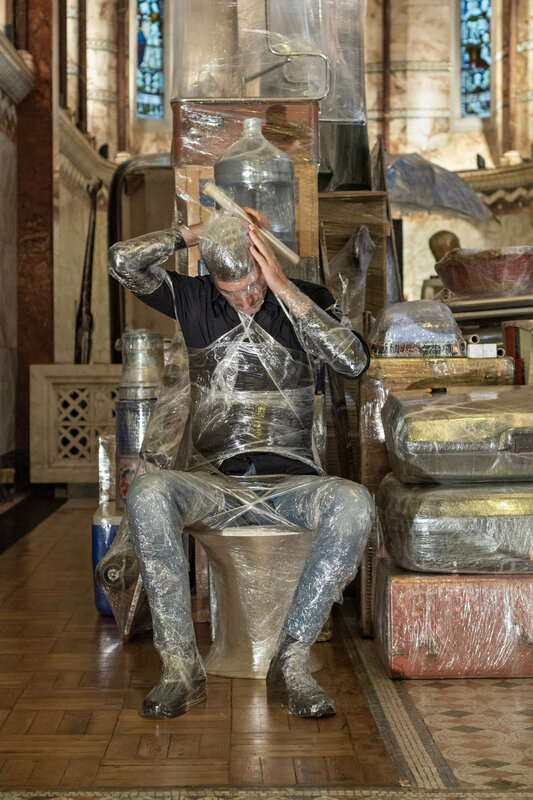 The exhibition in London will also include a new performance whereby individuals wrap themselves in the same polyethylene film, whilst moving through the installation. A hybrid work, which is at once sculptural, pictorial and installation, Crisálida also sees the metaartistic inclusion of a number of López’s own artworks, as well as works in the artist’s personal collection by well known Latin American artists such as Rafael Barrios, Rodrigo Echeverri, Adrián Pujol and Jesús Soto. In addition, objects originally belonging to López’s grandparents are included. They reference another exile in López’s family history as they were brought to Venezuela when his grandparents fled Spain during the Civil War more than 70 years ago. The combination of owned, borrowed, found and gifted objects included in the work can be seen to represent the labour of such a departure and also the possibility for transformation that it implies. The exhibition will be accompanied by a fully illustrated publication designed by Beirut-based graphic designer Farah Fayyad, with imagery by Caracas-based photographer Julio Osorio. It will include essays by Tamara Chalabi and Elizabeth Marín Hernández, Associate Professor in Contemporary Art at the Universidad de los Andes, Mérida. In a pertinent continuation of the exhibition’s themes, all the objects included in the installation will be listed in the form of a shipping ledger. Thumbnailed entries, including unexpectedly personal descriptions of the inventory, will highlight the clash between the personal and the prosaic inherent in the preparation for any journey. The ledger’s reference to shipping procedures for the international loan and sale of artworks will also provide a provocative extension to López’s artistic investigation of exile. Pepe López (b. 1966, Caracas) is a Venezuelan artist who lives and works between Paris and Caracas. López works in a variety of mediums, including painting, sculpture, tapestry, collage, photography, video and performance. He has worked on major multidisciplinary projects at institutions such as the Puffin Foundation, New York City; Sala Mendoza, Caracas and Museo de Bellas Artes, Caracas. López’s practice is deeply rooted in the foundations of Latin American abstraction, whilst his process interrogates aspects of contemporary life such as violence, terrorism, consumerism and identity politics. In his latest series of works, López has worked with artisans from the Wayuus people of the Guajira Peninsula in Venezuela and carpet weavers from Uttar Pradesh in India, as well as artisans from Petare, a high density urban area in Caracas. Together they have woven traditional colourful tapestries and carpets out of images of cities that López creates, inspired by technological mapping systems. In another recent series, the artist has painted and woven fashion logos on traditional indigenous baskets to make a ‘cartography of consumerism’, transforming everyday objects into allegorical representations of complaint.